1. How do I fix lumpy gravy? Pour it into a blender or food processor and process until smooth. Or pass through a fine sieve to strain out lumps. 2. How do I keep my pie crust from getting soggy? Brush the bottom crust with beaten egg white or partially bake it before pouring in your filling. 3. What size turkey should I buy for my dinner? Calculate about one pound per every adult in attendance. If you have a small oven, consider roasting 2 smaller turkeys side-by-side. 4. What's the difference between turkey "stuffing" and "dressing"? Technically, dressing is stuffing that's cooked outside of the turkey, but it's really just regional/cultural semantics. 5. 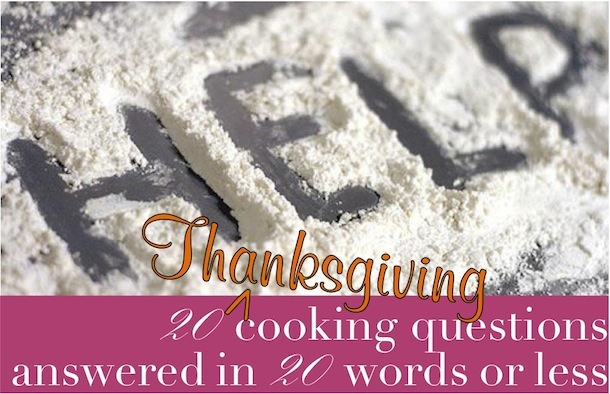 What's your top Thanksgiving tip? Roast the turkey upside down. It protects the breast from overcooking and the juices from the dark meat will seep down and keep it moist. 6. 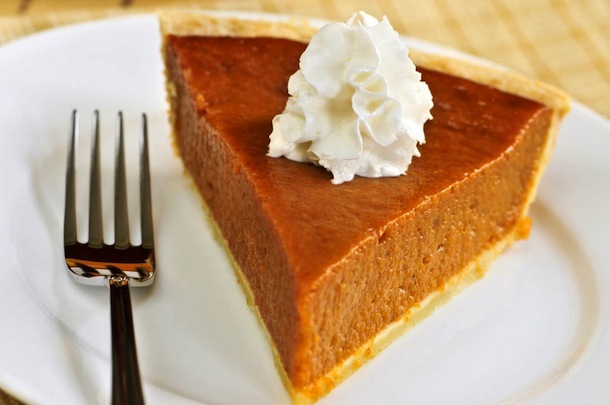 How do I keep pumpkin pie from cracking? Underbake it slightly. Just bake until the filling is barely set in the center, but firm on edges. 7. How do I defrost a turkey at the last minute? Submerge the whole turkey (still in the packaging) breast-side down in cold water. Change water every hour. Turkey will defrost this way at rate of 30 minutes per pound. 8. Can you roast a frozen turkey? Skipped #7 on this list, eh? It's OK! It's a little tricky, but possible. Click here for directions on how to roast a still-frozen turkey. 11. What's the best way to reheat cold turkey? Best and tastiest is in the gravy. Slice turkey and simmer until hot in a skillet with gravy and some broth or water. 10. What happens if we start to carve the turkey and it's still raw inside? Discreetly take it back in the kitchen, cut it into pieces & spread on a baking sheet to finish roasting. 9. I don't own a roasting rack. Any DIY alternatives? Scrunch a bunch of foil into a 3-foot snake, then coil it into a ring. Or use a few clean empty tuna cans. Or a few whole potatoes. 12. How do you fix dry stuffing? Pour on some stock or broth (or water), cover with foil, and pop in the oven for a bit. 13. What's an easy basic gravy? Saute 1/4 cup of turkey fat or butter and 1/4 cup flour. Pour in 4 cups hot broth. Whisk until gravy-fied. Season. 14. Can I bring a pie as a carry-on? You can! Pies, cakes, and other "solids" can go through security. 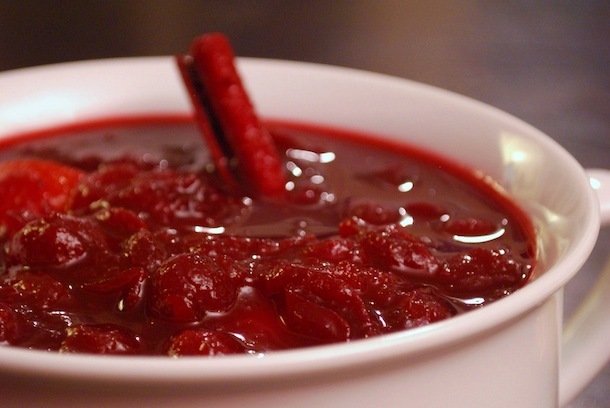 Booze, gravy, jam, cranberry sauce, and other "liquids" need to be checked. 16. What happens if I have a major last-minute cooking disaster? Chuck it & don't mention it. Nobody will know. Unless the disaster is the turkey. In that case, confess; pour more wine. 17. My sister is gluten-free and I planned desserts for her, but totally forgot about the gravy. How do I thicken gluten-free gravy? Use cornstarch or arrow root powder. 18. What's an easy side-dish I can make with little time and even less skill? Chop up a bunch of your favorite fresh vegetables, toss them in olive oil & kosher salt, and roast for about 20-30 mins in a 400 degree oven. 19. What's the quickest way to sober someone up so he can drive home? Don't you dare even try it. Call him a cab, have another guest drive him, or let him sleep on your couch tonight. 20. What kind of music should we play during dinner? I love warm autumn-type music. Classic jazz/swing standards, a few quirky songs off the Charlie Brown soundtrack, and a little bossa nova. Got more questions? Email me, find me on Facebook, or Tweet me on Twitter (@nandita). I'll be checking in sporadically today and most of tomorrow to help out with any last-minute Thanksgiving questions you may have!